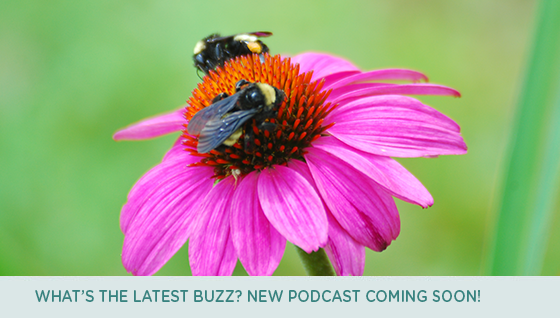 As part of our continuing efforts to bring you the latest insider information about all things parks and wildlife in Texas, Texas Parks and Wildlife Foundation (TPWF) is producing a regular series of podcasts. We will be interviewing the experts at Texas Parks and Wildlife and will bring that information to you in a convenient downloadable file. So, what would you like to hear about? As we begin scheduling topics for the podcast, we’d like to hear from you about what you would find interesting and informative. Would you like to hear from key Texas Parks and Wildlife officials about the conservation issues of the day? Or maybe wildlife experts about how the next hunting season is shaping up? We want to provide information that YOU want to listen to, so please take a moment and tell us what buzz you want to hear! As TPWF celebrates our 25th anniversary in 2016, we’re reflecting on the many wonderful projects that have been made possible by the support of generous donors and members. Our very first brick and mortar project, the Texas Freshwater Fisheries Center, is also celebrating a birthday this year. It was 20 years ago in 1996 that the Edwin L. Cox, Jr. Texas Freshwater Fisheries Center first opened its doors in Athens, Texas. 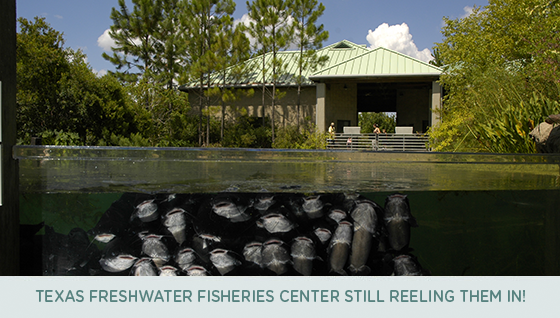 The center features an exhibit-filled visitor center, a fish production hatchery and is also home to the Toyota ShareLunker program, which was created to promote catch and release fishing of trophy largemouth bass. Since 1996, hundreds of lunkers have been donated and more than one million visitors have come through the doors. You can help support projects like this one by becoming a member today. Did you know that the very first lunker caught in Texas was named Ethel? And that her funeral garnered worldwide headlines? Watch this video to learn more about Ethel, and how she helped spawn the Texas Freshwater Fisheries Center. Congratulations to Jeff West of Lavernia for submitting the winning photo for April! Jeff West is a retired Air Force veteran who has travelled the world. But he says there’s no place he’d rather be than Texas in the springtime! We couldn’t agree more! Jeff found this spectacular spot just outside Lavernia, and returned right before sunset during “golden hour,” and was rewarded with this month’s winning shot. 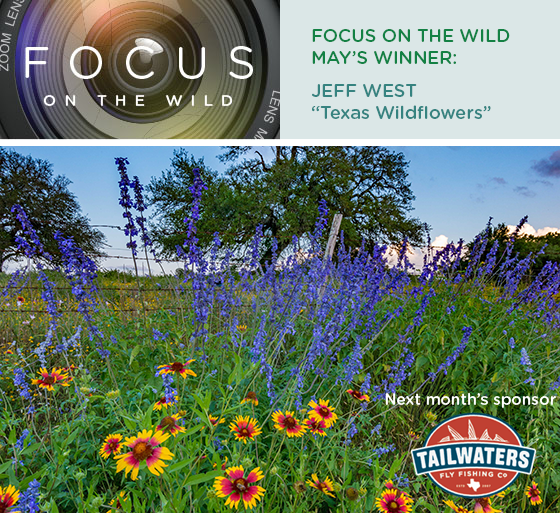 “Photographing nature’s beauty has given me a profound awareness and appreciation of the planet, Mother Nature, and most certainly Texas,” he said. Texas Parks and Wildlife Foundation sends a heartfelt thank you to Jeff West for his service….and for sharing this glorious photo! The May photo contest theme is fishing in Texas. Whether you enjoy coastal fishing, freshwater fishing or fly-fishing, you can enter your favorite photo and see if you might win. The winning entry will also score a GoPro Hero4 camera and Patagonia rolling duffel bag courtesy of Tailwaters Fly Fishing Co. To have a chance at winning, be sure your photo fits the theme and is submitted by May 25. Even if you submitted a photo previously, you can still enter this month. Read the contest rules to find out more.